For a while now I’ve been heading down a path where if I don’t have an entire day for painting, I won’t go out. Which is pretty odd, considering how much I talk about the joy of integrating sketching with our daily lives. But these days I don’t often have a full day free. And with the weather here getting crisp, you really can’t be standing around in the park anyway. So I set myself a goal – do an errand that needed doing, but make it into a sketching run. I grabbed a folded accordion book, and made a dash downtown by metro, with the goal of walking through my favorite square (Dorchester), heading over to the best pen store in Montreal, (Nota Bene), then zipping through the new wing of the art gallery where there’s some 19th century statuary that I haven’t had a chance to look over. So, after running through Place du Canada – still full of Remembrance Day wreaths on the war memorials, I ducked into Marie Reinne du Monde for some stone saints and bronze angels. It’s interesting to see where some of our social dynamics come from. Nothing but row on row of greybeards up on the walls. They sure venerated their old men. Which as an old man in training, I can’t complain about too loudly. But it’s striking how it’s uniformly an old boys club of authority figures – until you get to the heavenly angels – then it’s all pretty girls in transparent gowns. Sorry to be so blasphemous – but it’s right there on the walls. The church doesn’t pass the Bechdel test. Finally ending up at the Beaux Arts. My favorite of the new pieces was the brazen figurine of Napoleon credited to Jean-Léon Gérôme. 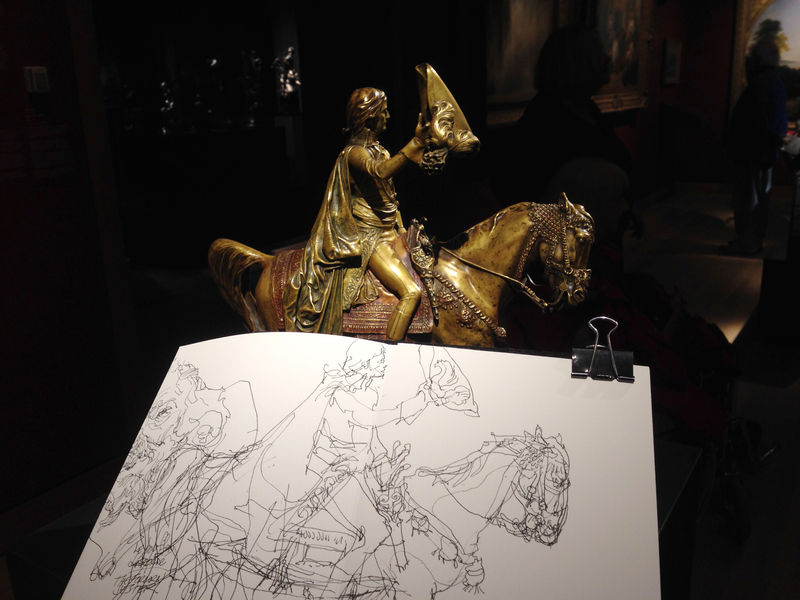 I only know him as a painter, so it’s very interesting to see this finely crafted horse and rider. I’ve been wanting to try my hand at sculpture – but I always feel like that would be cheating on my first love of painting. Maybe next year I will set aside some time – I’ve been dying for an excuse to buy some gear for it. Marc, I think the painting gods would be please if you expanded your very accomplished skills. They would love to see what someone so rooted in 2 dimension could do with three. Go for it. Marc i really enjoy reading your blog. its like talking to one of my buddies. These are wonderful. Are they fountain pen ink, dipped ink, or other? Isn’t it odd that we are so ingrained in “should” or “musts” that we consider another media as cheating? I went to a classical art school and they only wanted us to paint in oil. Not one watercolor class at the time. Hey Judy – these are with an extra fine platinum carbon pen – a fountain pen, but not really a flexy one – just smooth thin lines. I love you! I want you to move to Chicago. I love your stuff! I wish I had time to follow you around all day! Thank you for blog! Thanks for mentioning the Bechdel test, it is so important the sexism is the art world and the world in general be dealt with.. great sketches as usual.. I have been joining as many sketch walks here in the SF Bay Area as time allows. I sell my ceramics and paintings at art fairs and spend my time making art, which is wonderful..
a great idea sketching statues! a great way to practice some quick figure drawing as statues do not move! i know…silly…but you know what i mean. i have never been too good with figures and i practice as much as i can sketching folks in restaurants and so on….statues would be good, like i said they stay still! 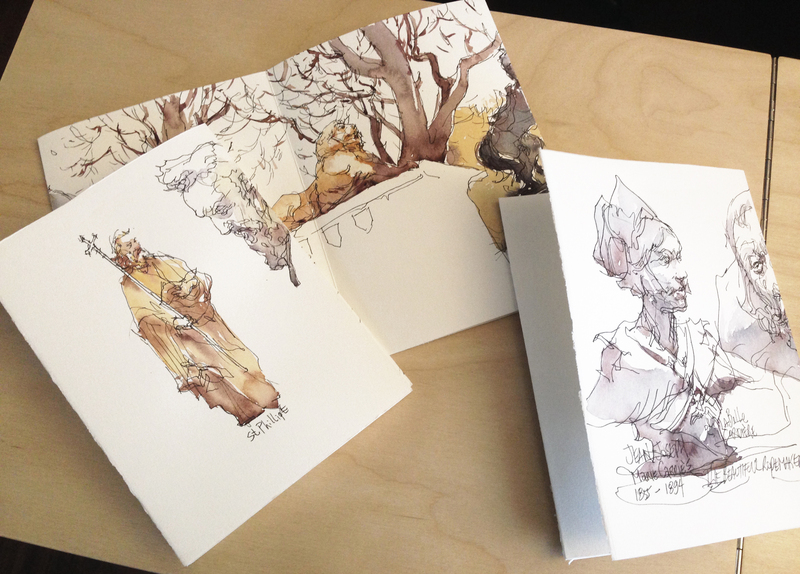 So I set myself a goal – do an errand that needed doing, but make it into a sketching run.